Competition inspired body design, layout, and size all catered for optimum performance. Meets all U.S.R.C.C.A minimum requirements. Dove-tailed front and rear to minimize interference with tires. Rounded roof line and cab forward design to improve roll-over recovery. Photorealistic die-cut premium vinyl decals include window frames, headlight, grille, tail lights and more! Overspray film and pre-cut vinyl window masks make painting fast and simple. 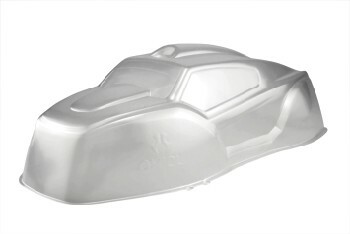 Made from durable .040" clear polycarbonate plastic for long life.